Car accidents are so stressful, even if they’re minor and there’s no serious damage as a result. But even tiny dings can cost a fortune to repair, especially if you don’t want to go through insurance and have your premium go up. If you have a small dent in your door or elsewhere on your car though, there’s a much cheaper option for fixing it. 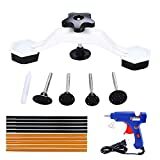 Pick up a Yoohe PDR Tools Pops-a-Dent Bridge Dent Puller Kit on Amazon for $15 and you can save yourself a $200 trip to the body shop.